In 2006, owner and designer Madeline Markos graduated with a degree in public relations and advertising from Chapman University. While working for an established printing company she began simultaneously designing numerous printed materials for her own wedding. 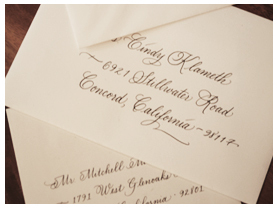 Working closely with Lorri Keevern, an experienced and talented calligrapher and owner of Style&Grace, Madeline was infused with a passion for fine invitations and accompanying papers. Her own wedding planning experiences led to a job for a local wedding planner and floral designer. Madeline soaked up the details and enjoyed the meticulous planning that contributed to successful events. In efforts to combine acquired graphic design skill, love of writing and passion for special events, Madeline began working on a freelance basis. With the support of family, friends, and her husband, Madeline started The Divine Invitation. Soon thereafter, she joined with Lorri of Style&Grace again for mentorship in navigating the industry and to supply customers with more services and products. By combining graphic design skills and a love for artful writing with a passion for special events, we are dedicated to serving others and pleasing God. He has blessed us with our talents and we must honor him in what we do. We will always strive to maintain a high level of integrity and a commitment to excellence, by delivering a unique and lasting grand impression through print and design.